Dan Dowling is a member of Shannonwatch, a group of peace and human rights activists and monitors, who hold monthly protest vigils at Shannon airport against the use of that airport for rendition-linked flights by the US military and for stopovers on their way to wars in Afghanistan and Iraq. They are also demanding that the Irish government ministers answer questions about the use of Shannon by foreign powers. 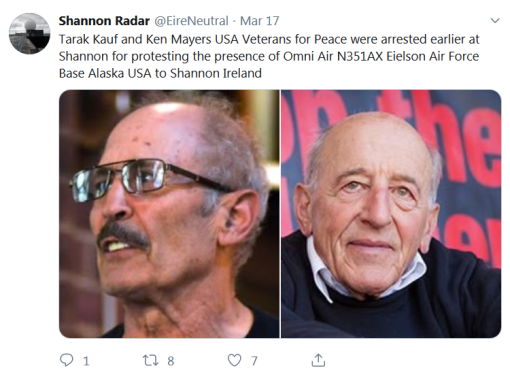 In 2017 he and another peace activist, Dr Edward Hogan, a former army commandant and UN peace keeper, were charged with allegedly writing graffiti on a US warplane at Shannon Airport. After his arrest Horgan had handed to Gardaí at Shannon thirty-five pages of a list of 1,000 children killed in conflicts involving the US in the Middle East, Asia and Africa. Recently, two elderly former US servicemen were arrested and imprisoned for thirteen days in Limerick Prison. Ken Mayers, aged eighty-two, and Tarak Kauff, aged seventy-seven, were later released on €5,000 bail posted by Edward Horgan. The two men, who are members of Veterans for Peace, are accused of breaching security at Shannon Airport on St Patrick’s Day, unlawful trespass and causing €2,500 worth of damage to the perimeter fence. Belfast International Airport is also being used by the US military with four C-130s seen there as recently as 28th February. This post lists archived flight paths of military planes and planes on contract to the military landing in Ireland from February 28th, 2019 to March 19th, 2019. At Shannon the majority of planes landing are Omni Air International Boeing 767s and 777s on contract to the US Military. Between February 28th to March 7th a Boeing US Navy C-40 and a Boeing C-17A Globemaster III also landed at Shannon. A Boeing 777 can carry three hundred and eighty soldiers. A Boeing 767 can carry two hundred and forty soldiers. A US Navy C-40 cargo plane is the military version of a Boeing 737 with a capacity for seventy soldiers and cargo. At Aldergrove fleets of Hercules C-130s were recorded landing. 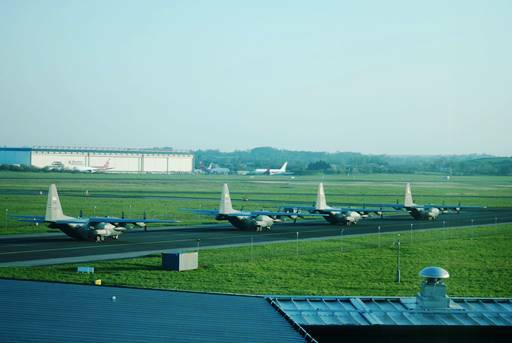 This photo of four C-130s at Shannon is what would have been seen at Aldergrove on February 28th, 2019.